Secrets of a university tutor: tetrahedral intermediates. The tetrahedral intermediate is one of those iconic species on which the foundation of reaction mechanism in organic chemistry is built. It refers to a (normally undetected and hence merely inferred) species formed initially when a nucleophilic reagent attacks a carbonyl compound. Its importance to understanding the activity of enzymes cannot be overstated. An example of this genre is shown below, in which a thiol reacts with an acyl cyanide to form the species ringed in green. Spectrum of a tetrahedral intermediate. What is shown is actually a difference spectrum, in which the spectrum measured immediately after mixing the two reagents is subtracted from that obtained after about 12 hours. The negative peaks represent a species which is being replaced by one giving rise to positive peaks. It is the nature of these latter peaks which directly prove that the species formed after 12 hours contains an asymmetric tetrahedral carbon atom. 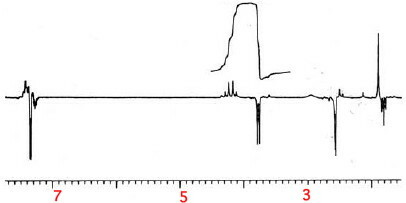 The negative peaks are ~δ1.8ppm (triplet), 3.8 (doublet [assigned to the CH2SH region], 2.6 ppm (the Me group of the acetyl cyanide) and 7.3 (the Ph group). The positive peaks are 1.9 ppm (Me singlet), an AB quartet at 4.2 ppm equal in integration to the negative peak at 3.8 ppm, and a more disperse Ph peak. If pressure is applied to the solution, the tetrahedral intermediate forms more quickly, and actually crystallises out of solution (Le Chatelier’s principle). If a hydroxylamine (RNHOH) is used instead of a thiol, the tetrahedral intermediate forms much more quickly, and both N: and O: nucleophilic isomers can be detected (by 15N-13C 2J couplings in the case of the former). Particularly significant is that the new product manifests its CH2 group as an AB quartet. This must mean that the two methylene protons are diastereotopic (have different chemical shifts and hence the coupling between them can be observed). This cannot be achieved by restricted rotation (atropisomerism) and hence can only arise by the CH2 group being close to an asymmetric (chiral) carbon atom bearing four different groups. The other interesting aspect is whether the tetrahedral intermediate is formed in two stages, the first being S-C bond formation, followed by a proton transfer from S to O, or whether it can form directly in a single concerted step. On the assumption that CDCl3 solutions contain traces of water, a synchronous mechanism does seem possible. The water helps transfer the hydrogen from S to O, as shown in the intrinsic reaction coordinate animation below (wB97XD/6-311G(d,p)/SCRF=choroform calculation). Notice how the H firstly leaves the S and hops across to the water, and only then does another H from the water hop over to the carbonyl group. The computed free energy barrier for this process is 22.5 kcal/mol, which is pretty much spot on for a slow thermal reaction. IRC animation for the formation of a tetrahedral intermediate. The slow motion capture of a tetrahedral intermediate using substituents finely tuned for the purpose (a relatively non nucleophilic thiol coupled with a relatively poor cyano leaving group) enables us to directly prove its identity using NMR. The same technique as it happens was also used to characterise another iconic intermediate, the carbocation, many years after it too was inferred as a key mechanistic participant. This entry was posted on Sunday, January 8th, 2012 at 2:14 pm and is filed under Interesting chemistry, reaction mechanism. You can follow any responses to this entry through the RSS 2.0 feed. You can leave a response, or trackback from your own site. Secrets of a university tutor: tetrahedral intermediates. is licensed by Henry Rzepa under a Creative Commons Attribution-Noncommercial-Share Alike 3.0 United States License.